No Mildew, Rust or Black Spot - Hardy as an Oak! A truly remarkable rose! Not only is the foliage extremely disease-resistant, but, having been bred in Canada, the plant is hardy to zone 3. 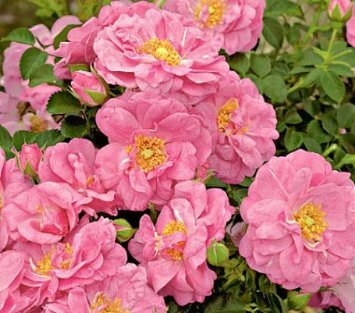 Then, there are the 3-4" flowers of pure pink that have an elegant old-rose form with a multitude of petals, and a sweetly spicy old-rose scent. They keep coming all summer until stopped by frost, shining against the abundant gray-green foliage. A vigorous grower, it can be grown as a large, spreading 5' X 5' shrub or trained to 5-7' as a really spectacular, carefree small climber.